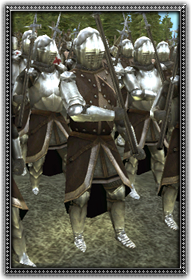 Armies are expensive to maintain, so when peace falls, Kings dispense with the services of many of their soldiers. Some however, enjoy the military life and form themselves into large bands often known as 'free companies'. Often supporting themselves by brigandage, they are equally happy to sell their services to anyone who can pay. These men are well armoured and armed with poleaxes.